Last night I finally finished pulling all the paper off my floral crackers quilt. 80 blocks, 79 different floral fabrics and 1/2 a ton of paper later I have this beauty. There was finally a break in the rain this morning, so I dashed out to take this photo. Not perfect conditions but I was glad for any sort of respite from the deluge. Enough about the weather… back to quilting. The top is made using the traditional cracker quilt block. I paper piece this top but you can find links to making the pattern on my original post here. I used as many bright multi-coloured floral fabrics as I could find and only accidentally doubled up on one fabric. There is a lot of Kaffe Fassett in this quilt along with Amy Butler and Denyse Schmidt. I used random black and white fabric for the background of the pattern but if I was to make this quilt again I would probably go with a low volume fabric option with more colour in it. Don’t get me wrong, I like the black and white but I think in hindsight more colour in the background would have made a different type of quilt top. This quilt already has a home to go to. I have till the middle of June to get it finished, so it can be presented to a graduating foster kid in the Portland area. Project Linus every year makes sure kids graduating from the foster system & high school have a quilt to take with them on the next stage of their life. 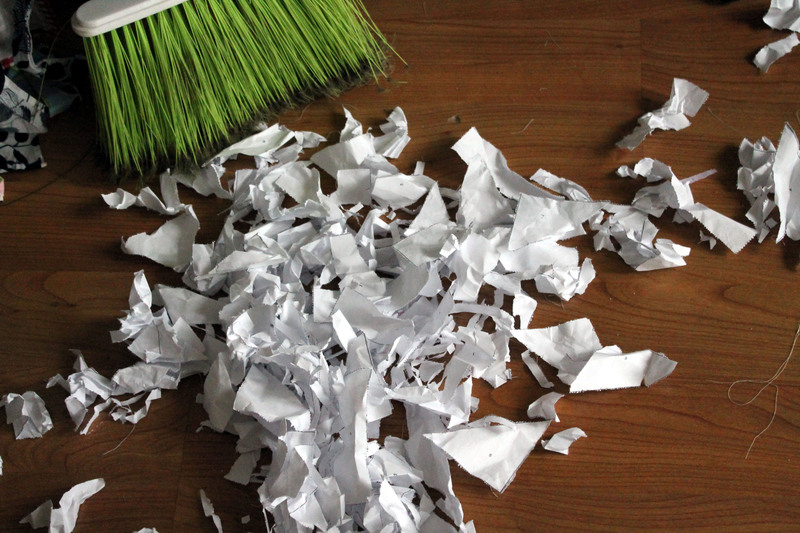 But for now I am off to clean up the paper mess I have made…. it is the curse of paper piecing! 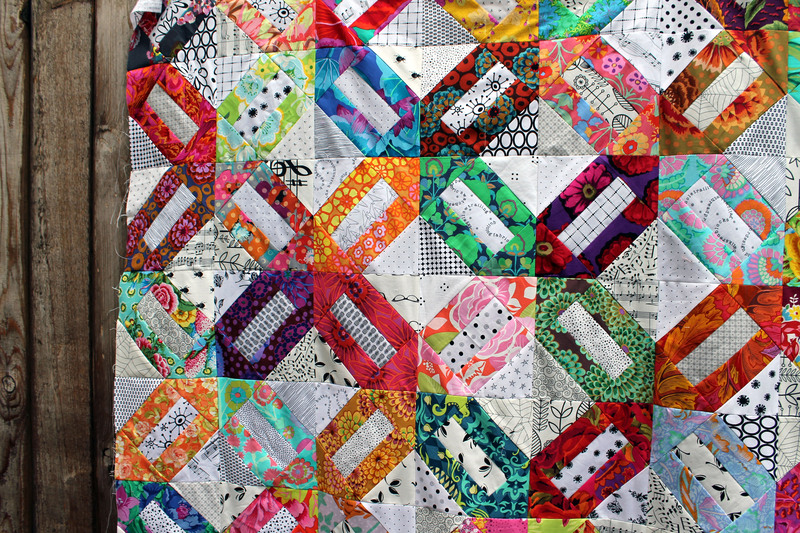 I am linking up with Crazy Mom Quilts for their finished Friday… I think a finished quilt top counts right! Do finish it up. I cant wait to see what yours looks like. Right back at you… just voted for your amazing emerald quilt on the Bloggers Quilt Festival. This is gorgeous…love the variety of fabrics! Thanks… I was surprised (and a little scared) by the amount of floral fabric I had in my stash! I just love this! Well worth ripping out all the paper! I love this quilt. I have yet to fall in love with paper piecing I always try too hard of blocks. I should try this one its most likely simple enough to not kill me over. With darker “crackers” I could see light colored backgrounds, bit for the ones you have, the black and white print is perfect. it is one of the features that drew me to your quilt in the first place. That pile of paper is one of the reasons I hate paper piecing. A finished top absolutely counts! I love the scrappy background. These blocks are so much fun. Thanks for linking up with TGIFF! I think the black and white is perfect – really I do. I’ve see so many bright floral quits with just a bit of color in the background and while they are pretty, I think your background really lets each color speak for it self. You know stand alone and be noticed, then all together making a beautiful quilt. I’m curious why you paper pieced this block? It looks easy enough to do without paper piecing. I personally like paper piecing (I’ve only done simple blocks) it’s very relaxing. And finally YES it’s a FINISH, thanks for sharing. When I started making quilts I did mainly only paper piecing. I find that I can do a quilt quickly and easily with paper piecing vs doing it more traditionally. I am not really a precise person and paper piecing helps with my precision (particularly on things like my compass stars). I also find it so much easier to do true scrap quilts (raiding the bin and finding snippets of fabric vs cutting your stash) with paper piecing. You do not have to precisely cut all your scraps – you can just trim as you go. I just realised that in the end it all boils down to laziness. Your quilt is very pretty! Very summery. I like the black and white background too. It helps showcase all those lovely florals. Paper piecing is accurate, but ripping off those papers is sooo painful! Great finish! I second and third the black and white! It gives sophistication to me. 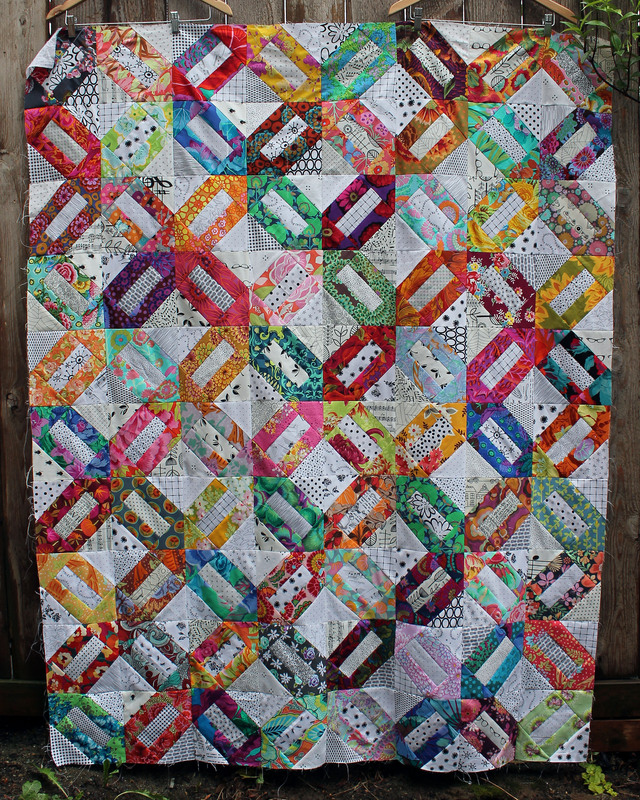 Like, this quilt is fun and colorful, but it is a little grown up. Gorgeous. This is lovely! I love the way the black & white accentuate the colors. Nice work! love this! do you want me to quilt it for you in a simple all over? send me email if you do and it can go next. I’ll even donate batting .. .. it can go next after I finish my Sisters quilt – I might even do backing too. OMG Rachel I would love it. I was blown away by the work I saw of yours at Modern Domestic. I have some fabric for the back that I was going to piece together. Lets talk more – I have never had a quilt professionally done before so I do not know what I need to do to prep the top. I love the black and white, jealous of all of them actually! I love that project Linus does that to celebrate graduation – that’s wonderful. I need to look them up. This quilt is a beautiful mixture of my favorite designers. A finished quilt top definitely counts to me!!! Haha. This is one of my absolute favorites of yours. It’s fantastic!! Gorgeous! Love all those happy colours and the low volume fabrics for the background. Such a stunning combination. LOVE it! Absolutely perfect! And i love the colours against the black and white! I love this! So colorful and cheery, and I really like the contrast with the black and white. That’s one lucky kid. yours is a beautiful sparkling quilt top!!!! I love everything about it. This has to be my favorite rendition of the cracker box pattern. I just adore everything about it! Also, I wanted to thank you for stopping by my blog and commenting today. I wasn’t able to reply because of your settings. This is really lovely! You’ve inspired me to look into paper piecing! I can highly recommend it. It can be addictive though. Hello, I just started following your blog. So I haven’t read too far yet, you might already know this. I see your paper torn off. I tell you what I use. Go to Hobby Lobby (hope you have one close by) in the Kids isle with crayons and colored paper. Buy kids tracing paper (take your 40% off coupon). Bring the paper home, using a stright ruler cut what ever necessary off the side to make it fit into your printer. Then print your patterns. It’s a thinner paper and working wonderfully!. You see yes I am a paper pieceraholic! Thank you so much Patti for the tip. I am going to hunt some kids tracing paper down at my local Michaels. I love trying something new and this sounds great. Will keep you posted.